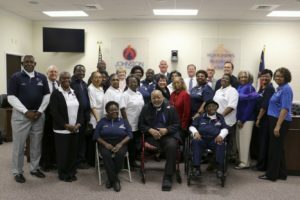 The Johnston County Board of Education honored the Cooper Heritage Alumni and Friends Association at their February meeting for their continued work in the Clayton community and for preserving the legacy of William Mason Cooper High School. Those pictured include: Front row (from left) Elgie Whitley, Milton Bridges, and Rosa Watson. Back row: John W. Smith, Jr., Johnston County Board of Education member Butler Hall, Joseph Whitley, Juliette Wall, Ernestine Bridges, George Tomlinson, Joan Brown, Johnston County Board of Education member Dr. Peggy Smith, Janice Atkinson, Louise Bridges, Melvin Bridges, Johnston County Board of Education member Teresa Grant, Johnston County Board of Education Chairman Mike Wooten, Lillie Kirby, Johnston County Board of Education Vice Chair Dorothy Johnson, Johnston County Public Schools Superintendent Dr. Ross Renfrow, Lavern Barnes, Johnston County Board of Education member Todd Sutton, Hilda Crudup, Johnston County Board of Education member Ronald Johnson, Clara Watson Lawson, Annette Evans, and Maxine Mitchener. Also honored but not pictured: Effie Sanders, Bessie Tomlinson, Wade Wall, Hilda Watson Banks, Ann Smith Mitchener, Willie Mitchener, and Anjanette Chapman.